Real life and blog life intersect in strange places. I was back home in Seattle for Christmas, at lunch with a second cousin, when she mentioned that she had a friend who had a young adult novel coming out. I wasn’t expecting anything (except the worst-case scenario: to hate the book on sight), but I looked up the cover on my phone anyway and HELLO! How to say this? Exceeded expectations. I don’t need to tell you that the cover is gorgeous, right? 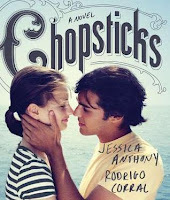 The book was Chopsticks (claro que sí), which I had already heard advance praise for in the blog world. I added it to my wishlist then and there, and the rest is history. Glory is a musical prodigy, and has been escaping the world at her piano bench ever since her mother died when she was eight years old. Chopsticks is a look at her life over 18 months, and it follows her romance with neighbor boy Frank. The interplay of chat messages, art, photographs and music tell several stories, and it is left up to the reader to discern how things end, and what has been happening all the while. While not strictly defined as such, Chopsticks reminded me of a graphic novel. It took just over an hour to finish, but I found myself going back to particular images several times just to ‘check,’ and I’m still putting together Spotify playlists of Glory and Frank’s mixed CDs. I could have lengthened my reading experience by watching every YouTube video and listening to every piece of music as it came up, but as a primarily visual person I was impatient to move on. When it comes to giving a verdict on Chopsticks, I have a few words: out of the ordinary, eclectic, intriguing. I think it is an excellent exercise in art and story, and creates believable mystery and tension. However. I am a print girl, and I did not connect as strongly with the characters as I would have with a book that had more, well, words. On the other hand, I am left with much brighter and clearer visual memories. Chopsticks is well worth the read if only for that. It is also the sort of story I want to discuss with someone else, so I'll be lending it to (read: forcing it on) my friends. Still wavering? Check out this article/interview with Largehearted Boy. The book is also available in app form (a slightly different experience, and one I didn't check out personally). The trailer for the app can be found here. Recommended for: appreciators of music and photography (and how when combined they can tell an entire story), fans of contemporary YA fiction, graphic novel enthusiasts, and anyone willing to try a new type of storytelling. Chopsticks just sounds so out of the ordinary! I wonder if these multi-media collections are where books are eventually headed?? the cover is gorgeous and the book sounds great! nice review. I've been delaying my review of this one because I'm less positive. I hate writing bad reviews. Awesome review. I think I would dig this one. Side note: I love the font. I'm such a font freak.